Aspiration Hosting Review 2019: Is Aspiration Hosting a Good Hosting? 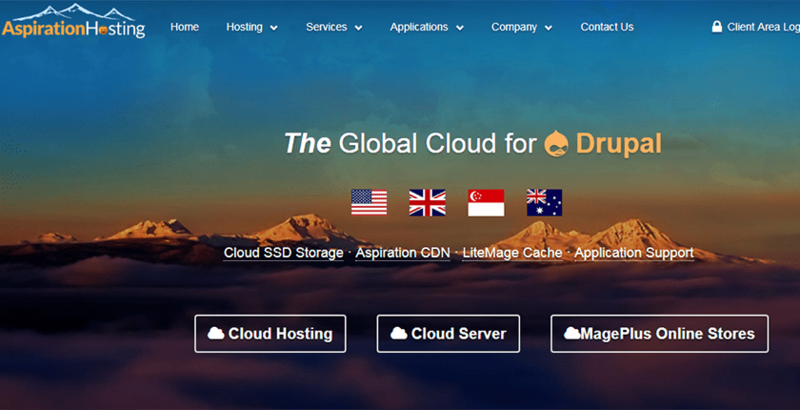 Aspiration Hosting is a U.S.-based company specializing in Magento cloud-based hosting solutions as well as other popular PHP applications such as Simple Machines Forum, WordPress, Drupal, and Joomla!. With strong presence in 30 countries spanning the Americas, Europe, Asia-Pacific, and Oceania, Aspiration Hosting has been rapidly gaining popularity since 2008. Aspiration Hosting is a U.S.-based company that specializes in Magento hosting solutions and other popular PHP applications such as Simple Machines Forum, WordPress, Drupal, and Joomla!. Although they are based in U.S., they have presence in 30 countries across the globe. Founded in 2008, Aspiration Hosting uses innovative technology to support companies with their web hosting needs. They deploy LiteMage Cache on their servers, known widely in the industry for being the fastest full-page cache for Magento. As previously mentioned, Aspiration Hosting uses LiteMage Cache on their servers. This is widely known in the industry as the fastest full-page cache for Magento, which ensures that your e-commerce website will load quickly and effectively for your customers. Not only does this impact user experience, but it also affects your search engine rankings — Google recently adopted it as one of the primary ranking measures for the websites they crawl. On top of that, Aspiration Hosting includes a free installation of their proprietary Aspiration Content Delivery Network (CDN) with most hosting accounts and promises a 99.9% uptime SLA, making sure that your website is readily available around the clock. While the Magento e-commerce platform is their primary specialization, they also offer hosting solutions for most popular PHP applications such as WordPress, Drupal, and Joomla!. This makes Aspiration Hosting a versatile choice for the most of their customer base. Of course, given their specialization, Aspiration Hosting includes free Magento auto-installers with all their hosting subscriptions. Aspiration Hosting has servers located all around the world, including in Asia-Pacific and Oceania. Clients can select their preferred servers depending on where their primary customer base is located; for instance, their Singapore servers offer excellent connectivity to Thailand and the rest of Asia-Pacific. Aspiration Hosting has three broad categories of hosting services: cloud hosting, fully redundant cloud servers, and their MagePlus plans, a no-limits e-commerce solution unique to them. Their entry-level cloud hosting plan starts users out with 5GB of cloud SSD storage, unmetered bandwidth, unlimited hosted websites and domains, SSL certification, a free website migration service, and 24/7 live chat and Help Desk support. This is sufficient for small e-commerce websites. Note, however, that this entry-level plan does not come with their proprietary Aspiration CDN, web developer support for application-level issues, and phone support; you’ll have to opt for their Pro cloud hosting plan for all of those. Aspiration Hosting’s pricing schemes are fair and affordable. They have many different packages that will satisfy most customers, from pre-made cloud hosting plans to customizable cloud servers; prices will vary depending on what you require. Their packages vary primarily in the level of customer support provided, software optimizations available, storage, and bandwidth. All categories include a free Global CDN, Magento auto-installers, and Litemage Cache. The number of available support channels will vary depending on the packages you purchase, but every hosting customer will have access to their 24/7 tech support service. If you run into any technical issues, you can reach them via a support ticket or live chat — round-the-clock phone support and web developer support is only available for select plans. Aspiration Hosting is straightforward and reliable company that provides a high-quality service for customers around the world. As a specialized Magento hosting solution provider, they offer a level of service that sets them apart as strong contenders in the industry. Wondering how Aspiration Hosting stacks up against other Web Hosting companies? Enter any other Web Hosting company and we will give you a side-by-side comparison.